Another work-free weekend called for a real brunch date -- Marcus and me, just the two of us. 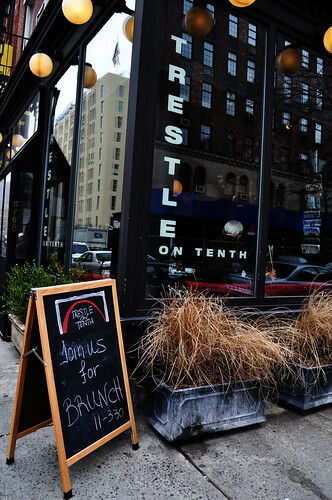 Per a recommendation from Derek, we decided to check out Trestle on Tenth over in Chelsea. 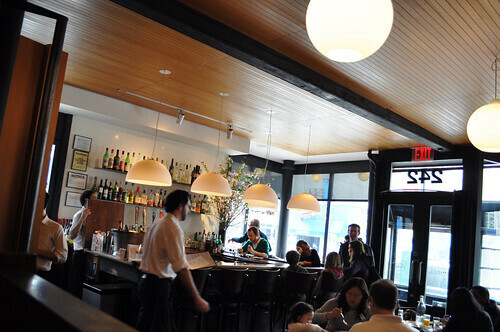 Open since 2006, Trestle on Tenth has "a respect for local ingredients" focusing on Swiss cuisine by Chef Ralf Kuettel. The mission behind Trestle on Tenth is simple: "great food and great service -- without the pretension" through "homegrown cuisine and honest hospitality." Growing up in Switzerland in a town at the foothills of the Alps, Chef Kuettel developed an early appreciation for "the earth's bounty and a taste for fresh, seasonal ingredients." He embraced this philosophy as he worked through restaurants in Switzerland which later landed him a spot in the kitchen of Union Square Café, Zoë, and Cena, as well as in top restaurants over in Seattle and Breckenridge. Along with "his pursuits in the kitchen, he also worked to expand his wine expertise through a wine buyer position at Chelsea Wine Vault -- a role that brought his food and wine knowledge full circle." Shortly after, Trestle on Tenth was born. Modern and rustic ambiance are married together inside Trestle on Tenth. 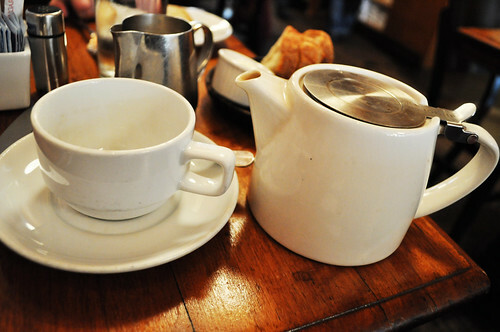 Full loose leaf pots of tea -- Marcus and I both had the Earl Grey. 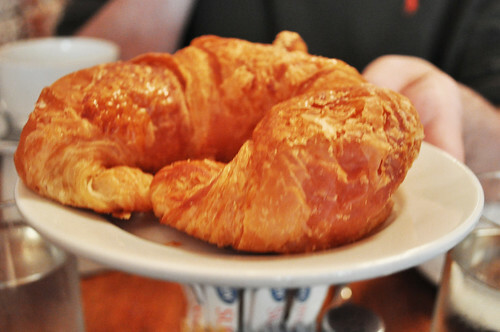 Marcus started with a croissant from La Bergamote, a nearby bakery. Per Derek's recommendation, I had the duck confit hash with poached eggs and sauce béarnaise. It had all the elements I love in a brunch dish -- poached eggs, a hashed potatoes, and an -aise sauce. The added bonus was the generous amount of shredded duck meat mixed in the potato hash. The béarnaise sauce gave this dish what hollandaise gives to eggs benedict -- a creamy unifier of flavor that blends together the starchy potatoes, savory duck confit, silky egg whites, and runny yolk. Highly, highly recommended. The perfect Sunday brunch lies ahead with this choice! 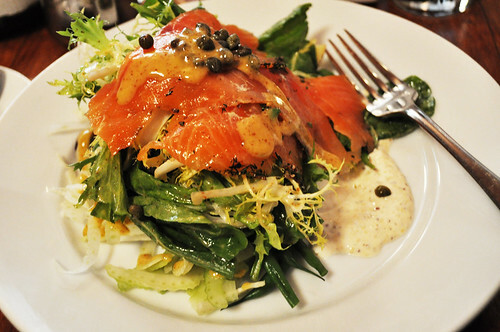 Marcus had the salad "niçoise" -- smoked salmon over greens with mustard green dressing and capers. Though a very basic salad, Marcus enjoyed this very much. 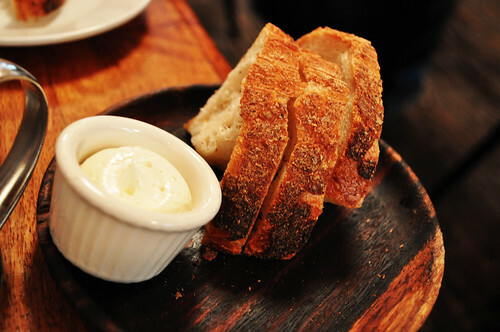 Perhaps the simplicity of its ingredients matched with their freshness. Findings: What I liked most about Trestle on Tenth is its "low-key" atmosphere. Brunch tends to be a bit too focused on the "seen and be seen" aspects of the experience here in the city, and I'm not too crazy about that. Ultimately, I just want to enjoy delicious food with great company, and leave it at that. Trestle on Tenth is perfect for that. No pretension -- just comfort and delicious brunch grub. 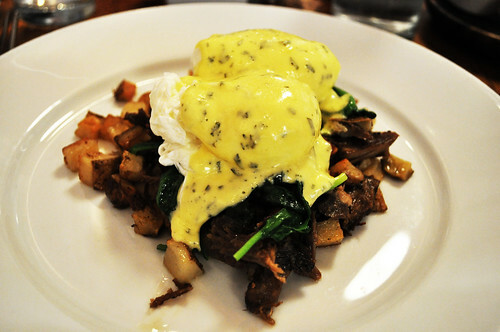 Treat yourself to the duck confit hash -- I promise you'll be back for more. Price point: $12-14 for each brunch course, $3 for each pastry, $4.50 for tea. oh my.... both of those entrees look heavenly. i would kill for that salad right now actually. oh man.